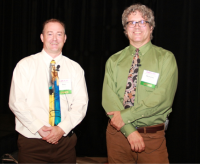 Stan Hudson and Nick Butler shared their experiences of working with two very different cities to establish a needs-based health literacy initiative. Hudson and Butler reviewed components to a healthy literacy initiative including being able to identify and engage skill sets around health literacy and competencies, develop strategic partnerships, monitoring, generating feedback, sustainment through implementation science and having health literacy networks. Hudson and Butler believe that essential tasks and components for a successful health literacy initiative include selecting steering committee members, participating in community outreach and engagement, organizing kick-off events and developing a request for proposal (RFP). They also expressed the importance of phasing the initiative to ensure tasks are focused for the timely completion of objectives. The incorporation of the following phases were part of their initiative in both cities: application procedures, review protocols, and selection criteria. Hudson and Butler discussed their experience and key activities that took place when developing their initiative. It is important to note that although the initiative was conducted in two different cities the same key activities were completed. Key activities conducted were a needs assessment, resource inventory, curriculum development, partnership development, demo projects and technical assistance.